Yippee Yeah It’s My Day. I hope you have been following along on the Hexa-Go-Go book tour. 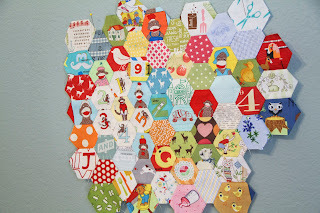 Tacha has outdone herself on her Hexagon English Paper Piecing book and has asked us to tell you what we think about it. This is just once example of the happy colorful projects in the book. Is Happy a color? It should be. If my unmade bed looked this good, Iwould never make it again. teaching stitches by making embroidered samplers. The luxury of EPP for me is that it is so portable and requires so few tools and supplies. I even keep a small bag in my car with a clover needle threader, needle and thread, hexagon papers and scraps. One of my favorite quilts in the book is a huge union jack quilt. I really want to make it, but instead I started on a smaller version of the US flag quilt. I worked on this during the London Olympics, so it is kind of the same, right? as hexagons so I am going to quilt it to look like hexagons. 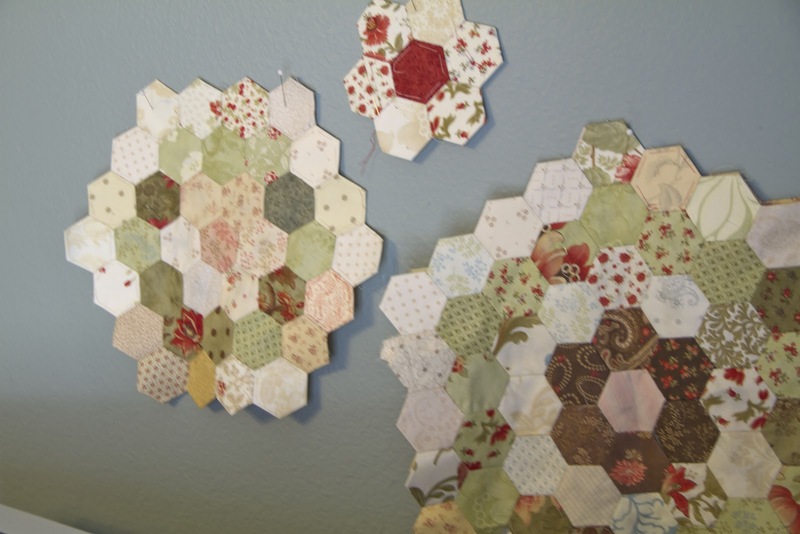 I talked to my friends at Accu-Quilt and …….. I have one Go Baby for some lucky person. 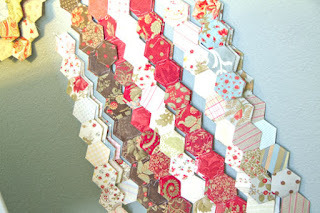 As you know I do love hexagons. There is something just so pleasing about it’s simple shape. Warning: EPP does become an addiction as you will see in these pictures. but I keep making more. I have even started machine piecing some of the hexy’s together. Read how in previous blog posts here and here. Sneak peek on my I Spy hexy quilt for a future grand child. No one is pregnant yet and I do not want to tempt anyone to get pregnant just to get the quilt. I have a long long way to go.More on this project in a future post. Tacha has taken the traditional EPP flower garden to an entirely new level. The hottest trend is the new English paper piecing. 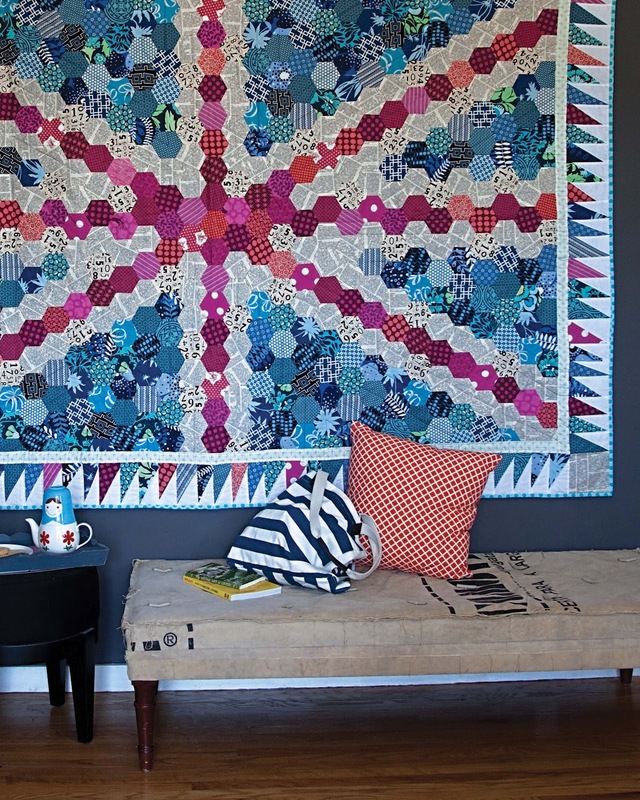 Amazing how great quilters are making a craft from the 18th century trendy again. There is an old saying: Nothing good comes from boredom. It’s said that idle hands are the devil’s workshop, an old saying dating at least as far back as Chaucer in the twelfth century who called idle hands the devil’s tools. Keep your hands busy with Hexy’s and start with Hexa-Go Go for inspiration and direction. their review of this book.